The shank, flank, and brisket are tougher cuts. The shank is mostly cooked in soups and stews because of its resilience. Marinating flank adds flavor and softens the meat’s fibers. Flank is most notably used in fajitas. While Brisket is usually barbecued, it’s commonly used for corn beef and pastrami. The most tender cut is the tenderloin. The short loin is also tender. That is where the t-bone and porterhouse steaks are cut — bone-in, or strip Loin (N.Y. strip) and filet mignon — boneless. Rib Eye is my favorite cut. It’s great for grilling. I always look for good marbling, which is the fat blending with the meat. That’s when you’ll get a lot of flavor. 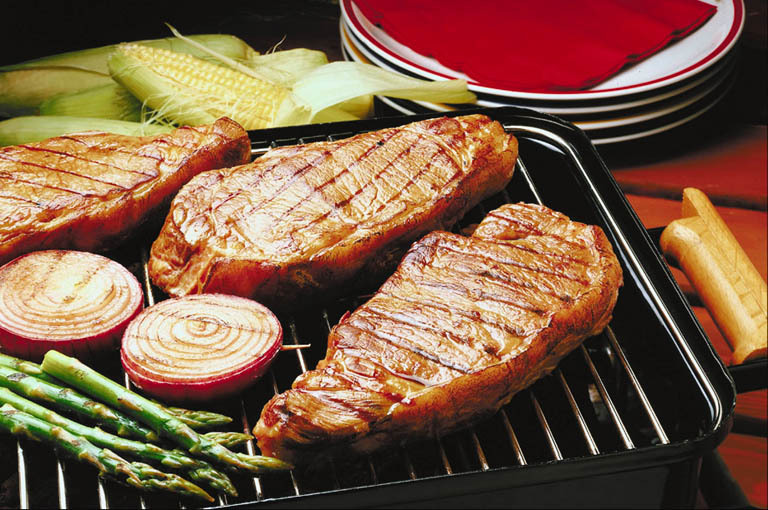 A good tip is to bring your steak to room temperature before cooking. When preparing rib eye, give it a generous sprinkle of kosher salt and some freshly ground pepper. Sear the steak — on both sides — in a hot pan for 3-4 minutes on each side. That forms a nice crust. Allow the meat to rest before cutting into it. That will help retain its juices.